In the late 1980s I discovered solitaire on pre-internet Apple computers, and often sat for hours lining cards up over and over and over, trying for that perfect game. One time Father Fagot at Loyola left me alone in the computer lab overnight, telling me "every game is winnable, play to win, expect to win." Bless his heart. I sat quietly clicking and trying and hoping until long past dawn. I have long since learned to stop playing solitaire, but now and then I have opened an ancestry.com free account, played around so that every single person has parents and grandparents and burial places. This gives me great satisfaction, and now in all that is going on in my life and the world, I really need to line things up in my ancestry and give order to this world. I'm doing it again, rebuilding all of my family tree from scratch, adding this person here, then that one there. 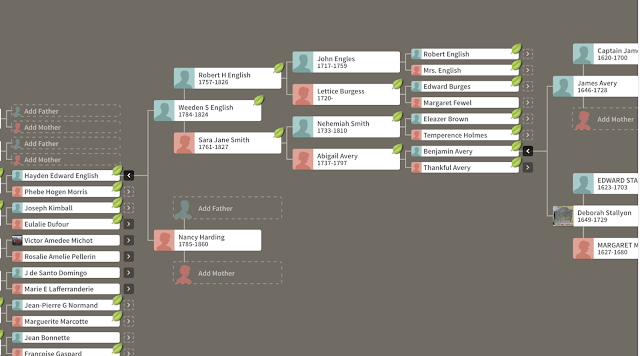 I spend over six hours tracking the life of one of my great great grandmother who is widowed then enters into a second marriage in 1890 to a man whose roots take me to a workhouse in 1850 where he is marked as "mulatto." In 1866 he is in Law School in St. Louis, then the 1880 census he is recorded as "lawyer" and "white." He is a full voting citizen in Louisiana before Plessy vs Ferguson and the Grandfather Clause and I wish I could go back and have a nice long talk with him about what he's going to miss. Ancestry is great for finding mortality rates across generations -- for example, I found someone family just doesn't live past the age of 53. I trace this back two generations, then three, then four, then five. I trace all the uncles too and the pattern fits. They all die young. But I don't say anything (would you?). The most compulsive part of Ancestry site is it gives you hint after hint so that you can hunt around and give each and every person two parents, and then find their grandparents and so one and so on. On my father's grandmother's side I can go back to pre-Napoleonic Quebec and France. Part of his family was in New England for the French and Indian War, while another part was in Quebec about to be exiled to Louisiana. I especially like to trace my father's roots back to colonial Connecticut and Captain John Avery who may or may not have been a pirate or least I am 100% sure there was a pirate around the same time with his same name. I want this to be true, I want to be born from pirate blood. Let me have this, OK? I traced Captain John Avery's decedents and they include the Rockefellers. Captain John's son James, befitting Puritan New England values, named one of his daughters "Temperance Avery" and another one "Thankful Avery " who will become my eight great-grandmother. Captain John has another son named Benjamin Avery who apparently marries his niece named Thankful (see above) which makes him my distant grandfather and great uncle, but let's push that off for another discussion on colonial society. I can't stop lining families up and finding where they came from, but I keep hitting a dead end with my father's great-grandfather. 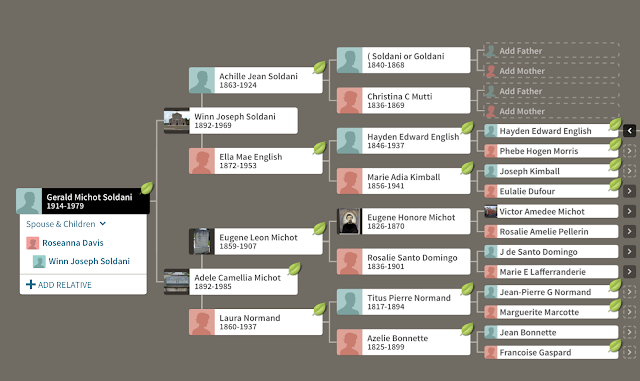 Notice how Achille Jean Soldani's parents leave me with dead ends. Just can't. 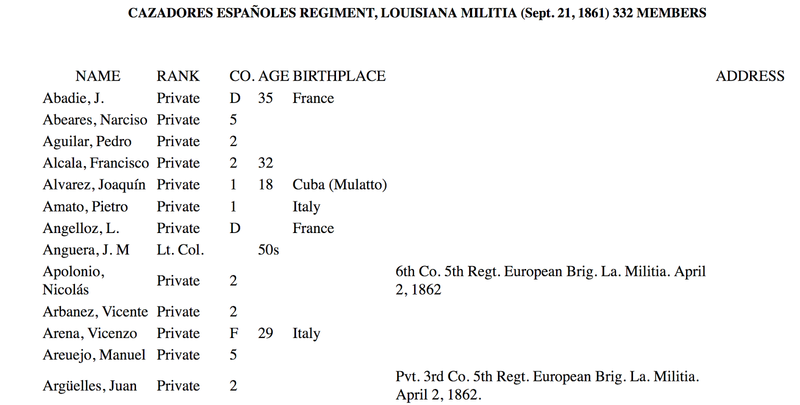 I plug in name after name and finally get a break when I find that Giovanni Soldani in New Orleans in 1861 served in the Confederate Army "CAZADORES ESPAÑOLES REGIMENT" or at least he showed up for the very first muster and that's it. Seriously, I can't find evidence past that, and I don't blame him for laying low when the Union blockaded New Orleans. When I look through records I see that it indicates that other members of the militia were foreign born, but nothing is written by his name to indicate that. 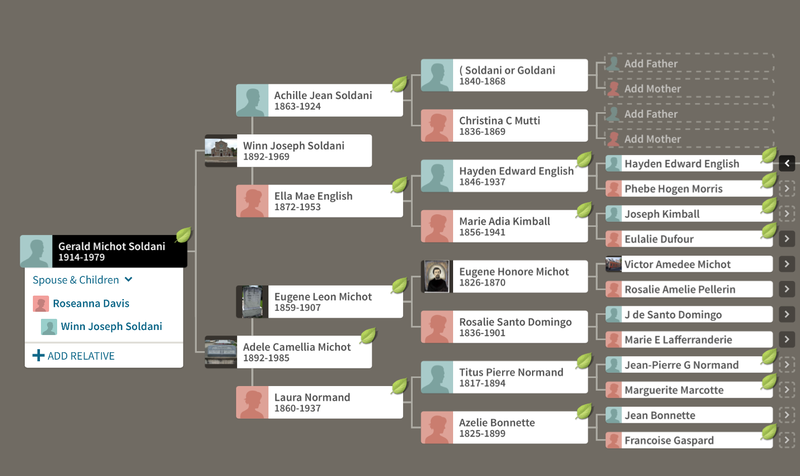 Giovanni Soldani has two children in the 1860s: Achille Jean in 1863 and Isoline in 1866. I have no documents regarding a marriage to Clementine/Christine Moti or Mutti, but a woman with similar sounding names is the mother of both children. 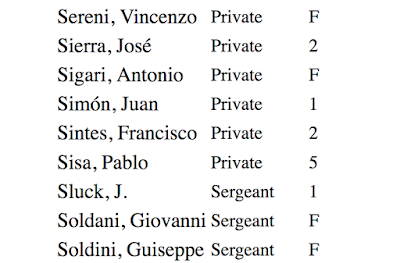 Spelling and names weren't as standardized back then, so I find when looking for Achille Soldani's father I find my father's ancestors have shifted names and Giovanni has become Jean and Achille is Archide and Soldani has become "Soldiami." I just can't figure out where Achille's parents went, but I knew he and his sister would end up in St. Mary's orphanage and he would be sent off in orphan train from New Orleans to grow up in Avoyelles Parrish in Louisiana where he would live near and then marry Ella Mae English. Ella Mae's family goes back to antebellum Kentucky, colonial Virginia, and pre-colonial New England. Ella Mae's husband's family goes nowhere -- they just appear in New Orleans when their kids are born. No census data, no wills, marriage certificates, no tombstones. I have to line things up, just like solitaire. You know this already. I search in database after database and finally come up with something. 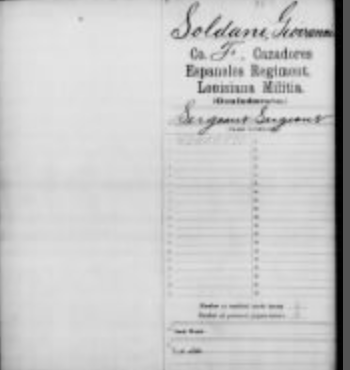 Giovanni Soldani aka Jean Soldani (Jean is his son's middle name, so we know this is extra sure) might have become John Soldani and pops up in Missouri in the 1870 census. I know from family history that his kids grow up orphans, so maybe just maybe he is the 50 year old pastry chef named "John Soldani" in the 1870 census who lives in a work house says his parent are foreign born. I find John Soldani (also known as Johann Soldani from Switzerland) popping up in California and wonder if my ancestor reinvented himself and forgot his first family. Maybe not, but still, it was easier back then. I call my dad and share my theory that something horrible must've happened to Giovanni Soldani's wife during/after the Civil War which caused Giovanni to leave the city and abandon his kids with the nuns, like "screw the Civil War I just got to America, I'm going to go make money!" I follow that theory all day in between baking hams and mashing potatoes and washing dishes but it takes me nowhere. Finally I start plugging in alternate names and I find out for sure that Christina Mutti (unclear if she married Giovanni Soldani or not but she had two kids with him) died in New Orleans on April 6,1869. I can't access the death certificate but I put it on my bucket list and add it to the reasons I need to visit Louisiana. Thanksgiving passes and I can't rest. I need to know where Giovanni went. 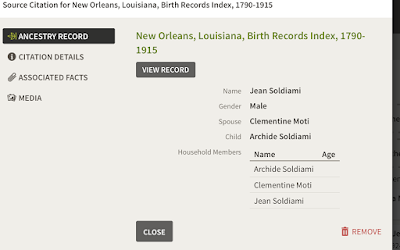 I try Giovanni Soldaim and Jean Soldani and Jean Soldaiami and Giovanni Goldiami and find that his name Goldani in his daughter's birth certificate. I can't help but wonder if the capital "S" in Giovanni's military ID looks like a capital G and that;s where the confusion is. Or maybe his name is Goldani and I have been saying my name wrong this whole time. I plug in variations of his name until I hit "Jean Goldani" and am speechless to find the name "Jean Goldani" in the Orleans Parrish death index. It says he died February 15, 1868 and gives me the address of the Louisiana Archives to write for more information. I just might. I would rather think he died than ran away from his children. Christina Mutti died in New Orleans the next year, a young widow who probably could not support herself. 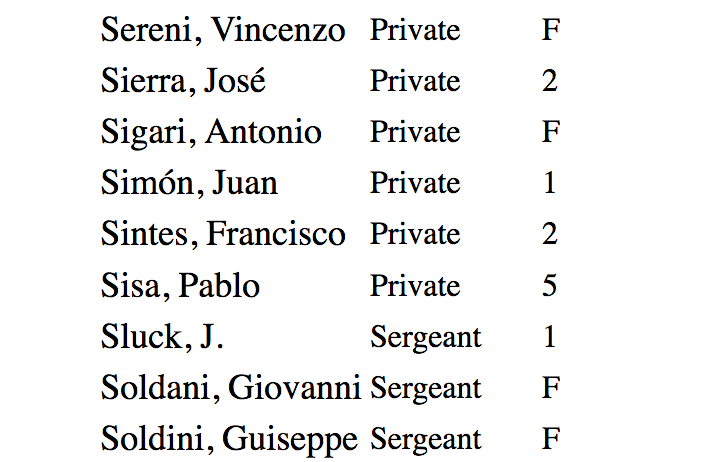 I try to plug their names into international registries to see where they might have come from -- Sicily? France? -- but thousands of hits come up and it is too much for me to sort through. It is enough, for now, to know that they lived and they loved each other and they faced obstacles that took their lives away before they could pass their stories to their children. I am thankful for the closure.